Canon cameras usually come with an SD memory card. You can lock or unlock these memory cards based on your need. Why Do We Lock Our Memory Card? You cannot use a memory card that’s locked. This means that a locked memory card will not let you take any more pictures. Users usually choose this option when they want to protect their pictures from being erased accidentally. 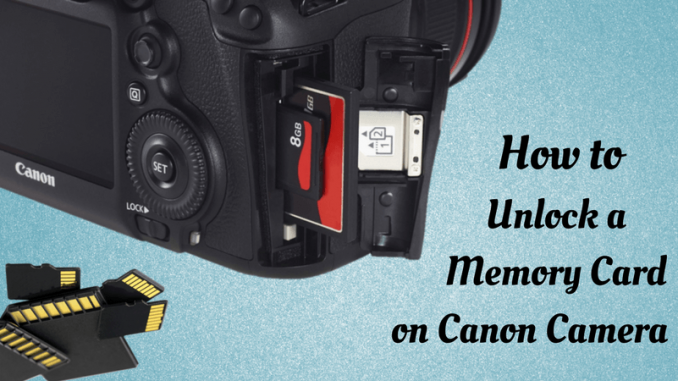 How to Unlock a Memory Card On a Canon Camera? On the side, you will see a compartment that has the SD memory card. Open this compartment. You will see a black button, upon pressing which, the memory card will be ejected. Once you press this button and have the memory card in your hand, you will see a plastic switch on it. When this switch is in the upward position, the card is unlocked. Flick it. Insert the memory card back in and switch on your camera. What is The Memory Card is Still Locked on Your Canon Camera? Even after you flick the switch, you may find that the card is still locked and you are still getting the “Memory card locked” error. In this case, the most common issue is that the lock switch is too loose to stay in one place. Thus, while you use the camera, it keeps fluctuating and causing problems. Check the memory card to see if this is the case. If the answer is yes, you will need to buy a new memory card. Some people use toothpicks to repair their memory card by themselves, but we would advise not to try something like this unless you are sure and are willing to risk it. 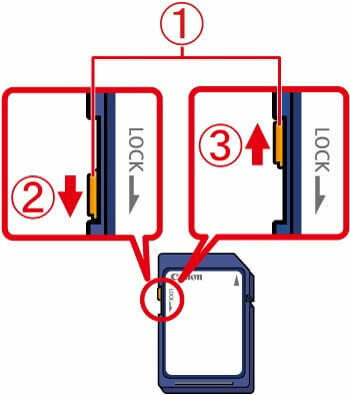 Some others also use tape to keep the switch in place or if they see that the card is cracked or broken. You could try this, of course, but this is definitely not a permanent solution, and we cannot vouch for it. Another reason why the memory card may be locked is that it is incompatible with your Canon camera. Many cameras have specific compatibility even within brands. This means that a card that works for an older model really may not work for another, newer model. Be sure that your card and camera are a good fit. Otherwise, there are chances that you may run into more severe issues than the memory card getting locked. A Canon Powershot memory card error is more common than you’d think and the solution is simple. Mostly, one of the above solutions will work for you, but if they don’t, we recommend you to get a new, compatible memory card. Have you tried any other ways to solve this memory card error on a Canon camera? If they have worked, we’d love to hear them!